What if there was a place where you could ask questions about where you’re going in life and how to get there? 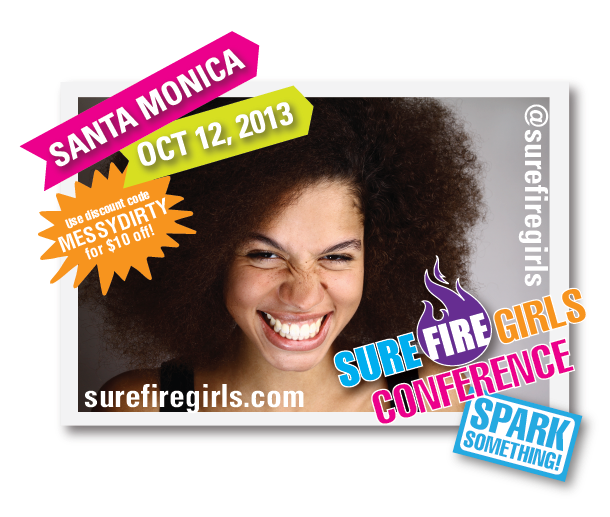 YOU, MessyDirtyHair readers are personally invited to the debut of SUREFIRE Girls Conference! 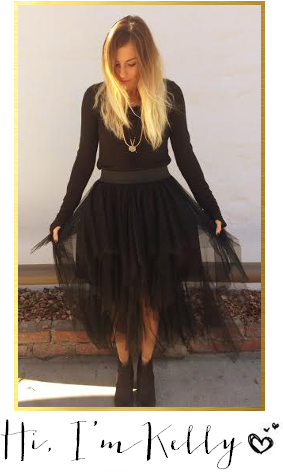 Much like us, SUREFIRE celebrates the unique person that is … YOU! SUREFIRE is the most exciting, engaging, rule-breaking event made only for girls where they can learn whatever they want to know about who they are, what they can be, and how to achieve their dreams. In fact, yours truly, will be blogging ON SITE! 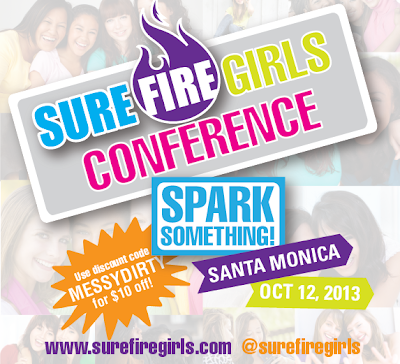 BETTY DEGENERES and RANDI ZUCKERBERG are confirmed as the keynote speakers!! Also speaking are Intern Queen's Lauren Berger, Kiva, MTV's Asha K, among others on board! They will have room to host 200 girls from 14 - 18 years of age, and 100 mothers. REGISTER? MDH followers get a discount! Register with MESSYDIRTY for $10 off! I hope to see some of you there...& if you do register to go PLEASE let me know, I would LOVE to meet you!! Don't forget #TheMessyProject is LIVE tomorrow!!!! I think the dark marble is exceptionally conventional. Artists utilized it. It is exceptionally lavish however needs cleaning, cleaning and support to keep it rich. whoah this weblog is fantastic i like reading your articles. Keep up the good work! You realize, lots of people are looking around for this info, you could help them greatly. I have never compare the price, but as a Singaporean, many of my Malaysia friends are asking me to buy computer hardware and digital camera for them. A lot of Lhasa pepole, especially the elders, follow Tibetan Buddhism. Their belief system is an integration of Tibetan Buddhism and folk religion.In the Tibetan Years of the Horse, the Sheep, and the Monkey, more people will take ritual walks around holy mountains and holy lakes. Leads Sheet is given to a tele marketing executive in advance. Leads are nothing but a list of potential cleints who need to be targetted. Despite complaints about trade imbalances, effects on domestic economies, currency upheavals, and loss of jobs, the reality of goods and services continually crossing borders will not go away. International trade will continue to be the engine that runs most nations. My dad has back pain and likes harder matresses. Hi there, i read your blog occasionally and i own a similar one and i was just wondering if you get a lot of spam remarks? If so how do you reduce it, any plugin or anything you can recommend? I get so much lately it's driving me insane so any support is very much appreciated. Hello! I'm at work browsing your blog from my new iphone 3gs! Just wanted to say I love reading your blog and look forward to all your posts! Keep up the superb work! There is also a choice of buying a desktop or a laptop computer. Although desktops tend to have higher specifications than laptops since the latter can be upgraded, there are some laptops with better performance than some desktops. As such, HRM techniques, when properly practiced, are expressive of the goals and operating practices of the enterprise overall.